Dermaplaning is an effective and safe exfoliation procedure. It uses a sterile surgical scalpel to shave the surface of the skin to remove excess dead skin and peach fuzz hairs. The tool is held at a 45 degree angle and is brushed along the skin to remove the hair and skin cells. It is generally a stand alone procedure, but it does create deeper product penetration boosting the products effects. The procedure makes skin look and feel smoother and will reduces the appearance of acne scars. 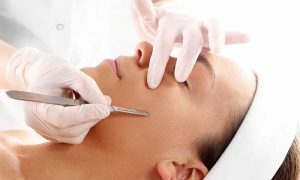 Dermaplaning is usually performed every three to four weeks. It is good to have the skin complete its normal rejuvenation cycle, which is thirty days, before going back and having the treatment done. The procedure generally will remove between two to three weeks of dead skin from the facial area.People who suffer from acne or have excess oil should not have dermaplaning performed. The reason why you want to avoid this procedure is because if the hair is removed from the area, the oils may cause bacteria growth which could lead to acne breakouts. There is no need to worry about the hair on your face getting any darker. Since dermaplaning only targets the vellus hair (peachfuzz) the hair will grow back the same size and color. It is physiologically impossible for the hair to grow back thicker and dark, so no need to panic and worry. Start off with a Cleanse, Dermaplane, Tone and Moisturise to Finish. welcome neck and shoulder massage, Dermaplane, followed by a Luxury indulgent Mask, finished off by a Scalp Massage, Facial lift Massage and an eye and neck rejuvenation. All rounder treatment to relaxation, radiance and well being. Begin your journey with a hot foot ritual, a luxurious back scrub, followed by a tension ease express expert back massage, a neck and shoulder exfoliation and massage, Dermaplane following a collagen eye treatment with a luxury anti-ageing mask and finished off with a heavenly scalp massage, hand and arm massage, a lifting face massage leaving our spa totally relaxed, radiant and youthful!